Creating a shortcut manually is pretty simple if you have some basic computer skills. The folders, "Target" and "Start-In" seen here are just an example. Don't copy them thinking they will work. Consult a qualified IT professional if you are unsure where to find your software folder on the network. 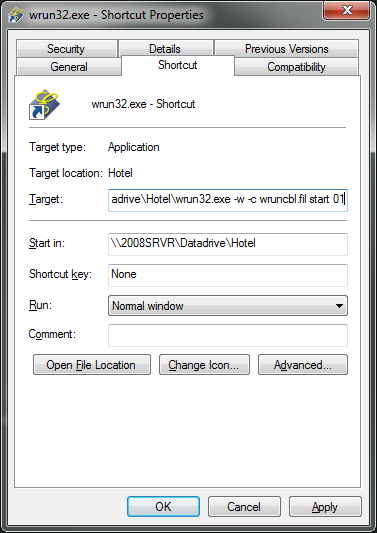 Open the software installation folder from the computer needing the shortcut and locate the file "wrun32.exe". Right Click it and drag it to your desktop. When you release the right mouse button a menu will appear. Select "Create shortcuts here". Right click this new shortcut and a menu will appear. Select "Properties". Click "OK" and then rename the shortcut to something like HOTEL 01, or FrontDesk 01, or Bar 01. You're the one who has to look at it and understand what it is so make it something simple and obvious, but please include the terminal number.